If you're concerned about bed bugs, contact us to schedule an inspection. We'll verify that bed bugs are present and create a custom treatment plan to eliminate them. Bedbugs are tough to eliminate on your own and they just keep coming back. Our Bedbug treatment is one of the most comprehensive and detailed you will find. Including thorough HEPA vacuuming, insecticide, mattress covers, Blackout Detectors, SenSci Volcano Detectors, and regular follow up inspections and treatment. Lane Pest Control is a certified Bedbug Free company and can help you get your home back. Find us at BedBug Central and to learn more about bedbugs. Our Bedbug Package is a monthly service that includes regular inspections and spot treatments after the initial treatment. This package also includes Protect-A-Bed Covers and SenSci Volcano Bedbug Detectors. Sleep tight, we've got you covered. Bed bugs are a small reddish-brown insect found worldwide. They feed off blood and are not know to transmit diseases to humans. They can be found in a variety of places such as homes, and motels. They don't fly but can move easily over floors, walls, furniture and are commonly moved to new locations through furniture, clothing and suitcases. Red itchy welts can be an indication that you've come into contact with bedbugs. Though it can take up to 14 days before the welt appears. Bedbugs are hard to notice because of their small sizes and preferences of living in dark crevices. 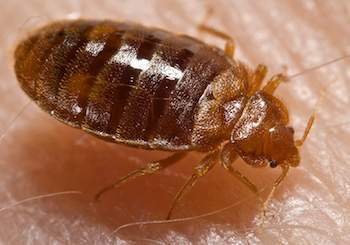 To check for bedbugs first check the seams and folds of mattresses. With heavier infestations you'll see them in baseboards and other furniture. Its important to remember that bedbugs are small and easily spread if you start removing items from the infested room. Bedbugs have to be introduced to your home for an infestation to occur. There are several tips to use when traveling and checking used furniture for signs that can help. For more tips on bedbugs visit BedBug Central.